We start our large storage onions from seed in our greenhouse in late summer/early fall. Once they grow to about the size of a chive, we transplant them into the field in groups of 3. As the onions grow, they push out from each other and not be over crowded. This technique allows us to grow the maximum number of large onions per square foot. The peaches are loving this warm spring weather and seem to be way ahead of schedule. With any luck we'll be picking peaches by the end of the month. What is Silvopasture? Silvopasture is the practice of integrating trees and livestock on the same land in a mutually beneficial way. In our case, we raise poultry in our citrus/peach orchard. The trees provide shelter to the the chickens and ducks. The clover, grasses and insects provide a diverse and nutrient dense diet for the poultry. In return the chicken and ducks provide organic fertilizer (manure) to the trees and light tillage to the soil. Would you believe that since we started raising poultry in our orchard over 2 years ago, we have not add any fertilizers or amendments to the trees and the fruit has never been sweeter. This is a great example of the benefits of working with nature and not against. 2. Cut off the greens of the beets and wash them under cold water. Grab three pieces of foil and wrap each beet individually, drizzling olive oil and sprinkling sea salt and pepper on each. Place on a baking sheet and bake in the oven for 25-30 minutes. Beets are done when they are fork tender. 3. In the meantime, rinse and drain the chickpeas and pat dry. 4. Heat a pan to low-medium heat, drizzle olive oil to coat the bottom and place in onions. Cook for about 3-4 minutes, stirring occasionally. 5. Pour in the chickpeas and add the seasonings including sea salt and pepper. If you would like it to be a bit more spicy, add in more chili powder to your liking. Cook for about 8-10 minutes. Stirring occasionally. 6. Check on the beets and when they are finished cooking remove from oven and foil and cut into bite size pieces. Pop into pan with chickpeas and turn down the heat just a smidge. Stir and cook all together for about 3 minutes. 7. Pop the tortillas in the microwave for about 10-20 seconds and remove. Place two on a plate and spoon in the chickpea mixture. Top with spring onions, goat cheese, and fresh lime juice. 8. Enjoy!! This recipe makes more than enough filling to have a share for 4-6 people, but the leftovers also taste just as good the next day! 9. Store remaining in an airtight container in the fridge for about 1 week. Spring/Summer CSA Week 5: fennel, spinach, spring lettuce mix, black tuscan kale, italian flat leaf parsley, i'itoi onions, orlando tangelos. 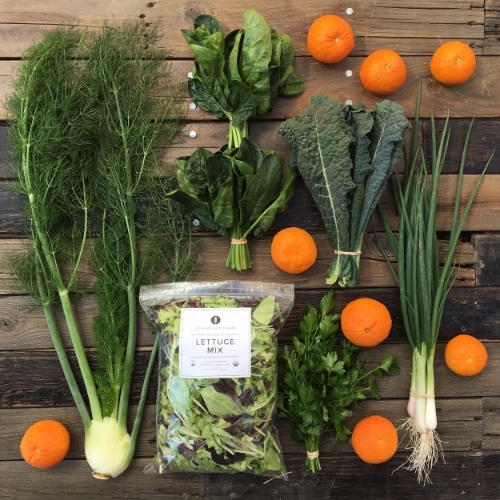 Spring/Summer CSA Week 6: baby mokum carrots, butterhead lettuce, leeks, spicy greens mix, hakurei turnips, collard greens, arizona sweet oranges. Spring/Summer CSA Week 7: baby mokum carrots, romaine lettuce, green onions, ripbor kale, french breakfast radishes, medjool dates, blood oranges.